Ann Phelan was not impressed with a debate on KCLR FM last night. A LABOUR JUNIOR minister has explained that she walked out of a local radio debate last night because she was tired, hungry and “extremely frustrated”. 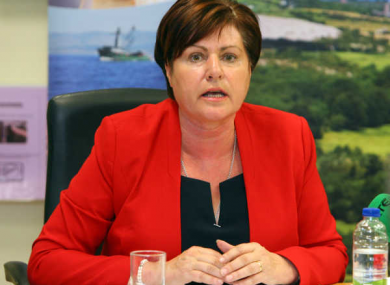 Ann Phelan, the rural development minister who is seeking re-election in Carlow-Kilkenny, walked out of the constituency debate on KCLR FM, branding it an “absolute disgrace”. Phelan engaged with opponents on a host of issues, but a question about Bus Éireann tipped the scales. Asked about bus services and employment in Graignamanagh in Kilkenny, Phelan began to explain that there was little demand in the town for a bus service. At that point, another candidate, Renua’s Patrick McKee, attempted to interject, leading to Phelan walking out of studio. Matt (host Matt O’Keefe) I’m just going to give up here because I came to this debate here tonight and I’ve been completely ignored and I’ll tell you right now I’m fed up of the whole bloody lot of ye. With that, Phelan left the studio and the debate turned to farming. Speaking to the same radio station this morning, Phelan admitted she could have handled the situation better but repeatedly said: “I am human”. “I absolutely did lose my temper,” Phelan told host John Masterson. Perhaps I could have handled it a little bit better but, you know what, I’m human. It was possibly just one of those days. Everybody hits a hump in the campaign. Phelan said she was very frustrated by the format of the debate and felt it could have been structured better, describing it as “15 people in a room shouting at one another”. Normally my tolerance levels are very high. Last night I was tired, I was hungry and I was extremely frustrated at what was happening around that table. Phelan was told that the reaction of listeners had been almost entirely critical of her, describing her as petulant and having let herself down. The Labour TD took the first seat in Carlow-Kilkenny in 2011, but faces a battle in the five-seat constituency where there are 15 candidates this time around. Email “'Tired and hungry': Labour minister explains why she walked out of local radio debate”. Feedback on “'Tired and hungry': Labour minister explains why she walked out of local radio debate”.